What is UC Article Linker? How can I access UC Article Linker? Sometimes there are several links and buttons in a database that point to full text. Which one should I click? What will UC Article Linker show me? What do I do if the article is not found? What if I see multiple links to the article? When would I use Interlibrary Loan? Additional questions? A problem to report? UC Article Linker is a service that seamlessly links library resources from the Library Catalog, online databases, and other sources, including Google Scholar. When you find a citation or reference to a specific article in an online database, UC Article Linker supplies the best available path to the content (in full text), from anywhere in the library's collection. 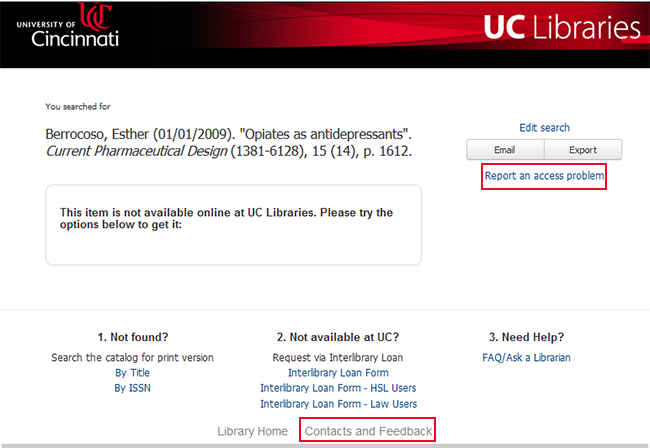 The UC Article Linker button or "Find Full Text at UC" link comes up on the results list or record screen in online article databases. In Google Scholar there is just the "Find Full Text at UC" link. For off-campus access enter your UC username and password when asked -- just like you do when using library databases from off-campus. In Google Scholar click on "Settings," select "Library Links. " Type in "university of cincinnati," select "University of Cincinnati -- Find Full-Text at UC", and save your preferences. When searching Google Scholar, just look to the right of the article title for "Find Full-Text at UC." Enter your UC username and password when asked -- just like you do when using library databases from off-campus. If the “HTML Full Text” or “PDF Full Text” link is available, click it to go directly to the text. If the full text link is not available or if the text does not display properly or you cannot access it for any reason, click “UC Article Linker” or "Find Full Text at UC." In some cases Article Linker will take you directly full text or a database that has has full text. It make take you several clicks to get to the actual text. Please read suggestions in the box below before submitting an Interlibrary Loan request. Click on the Journals tab or go to the e-Journals page and type in the title of the journal listed in the citation. Browse to the needed volume and issue. Search by DOI or PMID using the Search for a known article form on the e-Journals page. Search Google or Google Scholar - the article may be available on the public web, for example, in an institutional repository. Warning: the version you find online may NOT be the final published version. 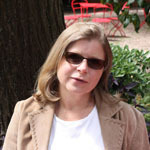 Sometimes an article is not available online due to a publisher's embargo, but UC may have a subscription to a print version. This is why we ask you to check the catalog for the print version. Please check the catalog BEFORE submitting an Interlibrary Loan (ILLiad) request form! There is incorrect or incomplete data to make a match to the article. The provider of the full text may not be able to translate completely the citation that is incoming. UC may not have access to 100% of content for a particular title. Please use the "Report an access problem" link or ask a librarian for help by clicking "Contacts and Feedback" at the bottom of Article Linker screen for items not available online. On the "Contacts and Feedback" select "Ask A Reference Question." In some cases you may see more than one link. when information provided by the link matches information stored with multiple documents in a database. Explore the list for the best match or modify and re-run the search. 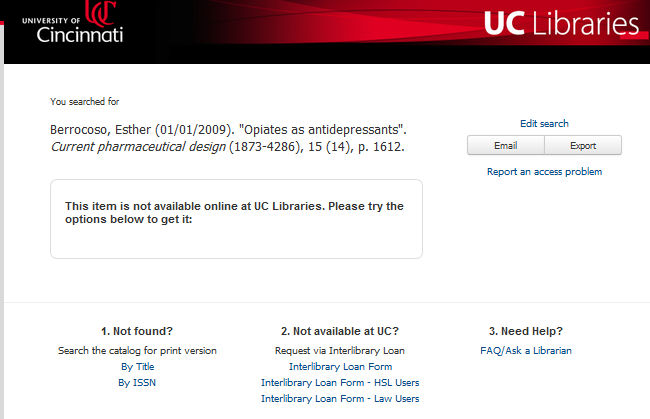 Articles not available online or part of the print collection of UC Libraries can be requested through the interlibrary loan service. Click on the appropriate interlibrary loan link and log in with your UC 6+2 and central ID password. The citation information for the article you need will automatically populate the interlibrary loam form. Just click “Submit” at the bottom of the screen and we’ll take it from there. Please check the catalog BEFORE submitting an Interlibrary Loan (ILLiad) request form! The link for reporting access problem appears in the right portion of the screen for requesting items not available online. Please provide as much detail as possible. 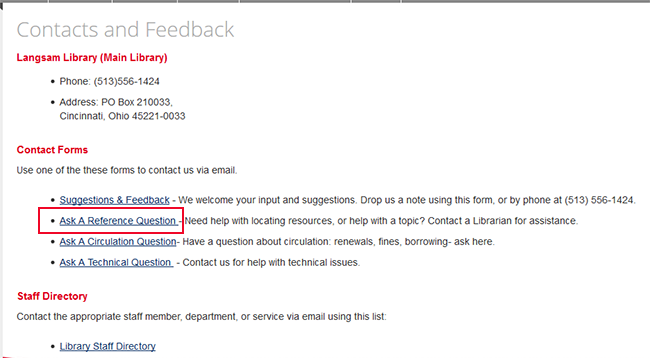 To ask a librarian for help, click on "Contacts and Feedback" at the bottom of the screen. On the "Contacts and Feedback" screen click on "Ask A Reference Question."